The crackling baby monitor pricks my consciousness awake. My own breathing stills as I strain to hear the faint breathing sounds of my 11-year old son. My body feels pinned to the mattress with a fatigue that comes from over a decade of interrupted sleep. It has been one of those nights. Four times the groaning cries of my son have catapulted me down the corridor with my eyes straining open only when I’m halfway to his room. Each time, I turned his body and repositioned his stiff limbs. 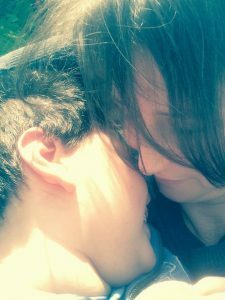 Other people’s voices often crowd my thoughts, and in the middle of the night it is the physiotherapist’s voice that comes to the forefront as I try to position my son in a way that will limit any distortion of his growing body. Eight times through the day I will hear the words of the half dozen doctors handling his care as I draw up a cocktail of syringes to manage his many diagnoses. I’ll check stock levels and expiry dates before contacting the local pharmacist, with whom I’m on first name terms. Six times between 5:00am and 11:00pm I’ll remember the discussions with the school nurse, giving me his most recent weight. I’ll recall the instructions of the dietitian and the direction of the company rep. Throughout the day and night I’ll set up the specialist pump to give him all the food and fluids needed to keep him alive via his PEG tube. Over a dozen times a day I’ll hear the words of the occupational therapists, from social care and health, as I hoist my growing son into his toilet seat, stander or specialist comfy chair. And I’ll hear the groans of my own aching back from a decade of lifting more than I should. I’ll remember the words of the local authority telling me they won’t fund a hoist in the living room because it isn’t important enough for my son to join the rest of his family snuggled on the sofa. I’ll feel disheartened at having to fight for help that I don’t want to need and I’ll hear the kind words of the community palliative care nurse who provides four hours respite a month. I’ll consider whether to pen another complaint email because the hours provided have been slashed and service may be taken away completely. I will agonise over the words of the hospice nurses who have discussed what will happen when my son dies, as he isn’t expected to live to adulthood. I’ll grow angry at the many thoughtless words from professionals as they underestimate the impact of caring for my son. I’ll feel overwhelmed by need to contact over fifty practitioners about my son’s needs. And I’ll marvel at the dedication and heart of the team of people who often go the extra mile. The gentle sigh of my boy filters through the monitor and I glance at the clock. 5:45am, maybe I can get another half hour sleep. A moment later, I hear the moans again and slide on my slippers. It’s 6:30am when I sneak into my son’s warm dark room. “Good morning gorgeous boy.” I soothe, as I kiss my favourite cheek in the whole world. My son opens his eyes but I know he can’t see me. His face breaks into a huge smile of recognition and slowly his lips purse into a kiss. “Would you like to get up?” I ask. A vague noise to many but a thousand words to me. And so the day begins. A day of loving, of smiles, tears and laughter. A day of ordinary and extraordinary, a day of feeling misunderstood and finding solace in my tribe. Of hard work and frustration, of tasks and satisfaction. A day living out my toughest job and greatest joy: being the parent of a child with severe and complex needs. These voices form a part of our life that most people simply do not see. This is a glimpse into the Secret Life of Us.